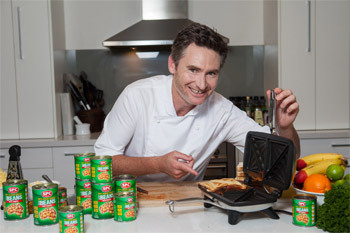 Comedian and TV personality, Dave Hughes, is encouraging his fellow Australians to start Australia Day the most Aussie way possible – with an Australian grown and made baked beans breakfast. New research, commissioned by SPC*, has revealed that nearly 1 in 5 (18%) of the sampled Australians consider the humble baked bean jaffle to be an iconic Australian food, alongside the likes of lamingtons and meat pies. Known for his Aussie larrikin sense of humour, Hughesy says that one of the things he does take seriously is the Australian spirit in supporting home grown. Hughesy commented: 'Aussie farmers have been growing baked beans to feed our troops since World War II. How Aussie is that?! The SPC research showed that one in five Aussies sampled get stuck into baked beans every single week of the year. They're tasty, nutritious and affordable; it's no wonder Aussies love their baked beans." The research also revealed that Australians are extremely particular about the way they eat their beans. While the majority (57%) surveyed like to keep things simple and prefer their beans plain on toast, others showed a dose of true blue Aussie ingenuity, with innovative favourites including a baked bean pie with bacon and onion, curried beans, and baked beans served with chicken and mushrooms. Hughesy agrees: 'There are plenty of exotic recipes out there, but there's nothing more Aussie than slapping some baked beans on toast or in mum's ancient jaffle maker; that good ol' metal joy maker always delivers. I have three young children that demand fun from the crack of dawn and this is my fail-safe recipe to keep them happy," said Hughesy. The SPC research shows that two thirds of Australians sampled consider Australian grown and made to be an important factor in their purchasing decision. With SPC, the only major brand of baked beans that is 100% Australian grown and made, Hughesy reckons it's simply un-Australian to eat overseas beans on Australia Day. 'SPC beans are grown by Aussie farmers in Kingaroy, Atherton and the Riverina district. Growing up in regional Victoria, many of my friends and family are employed by Australia's food industry so this is a topic that is close to home; I'm really passionate about supporting Australian grown and made," he said. I'm busy and I know you are too. You probably don't even think you've got time to read this recipe, but you do, cos it's quick. Part of my business is I've got three kids who start demanding fun at the crack of dawn. Here's the way to keep them happy (and healthy) first thing in the morning. It's my patented SPC baked bean jaffle. The brilliance of this recipe is that idiots like me can nail it. It's actually impossible to get it wrong if you follow my simple instructions. Step 8: While waiting, think about how tasty and easy to prepare the only major brand of Aussie grown baked bean on the market is, then whisper 'good on you SPC'. SPC Ardmona has been committed to bringing premium packed fruit and vegetables to Australians for nearly 100 years. Our iconic food brands, Ardmona®, GOULBURN VALLEY®, IXL®, SPC® and TAYLOR'S®, are strong performers in their product categories and are further developed and supported by our continued investments in both marketing and product innovations. SPC Ardmona is owned by Australian-listed company Coca-Cola Amatil.